Beloved local artist, Ernest “Brud” Jones Clayter Jr., was born in Vinalhaven <?xml:namespace prefix = st1 ns = "urn:schemas-microsoft-com:office:smarttags" />April 10, 1924 to Ernest and Augusta Clayter. He was educated in the Vinalhaven schools, but a diagnosis of tuberculosis at age 17 required a several months stay in a Boston sanatorium. Sadly, his life’s dream of becoming a professional baseball pitcher was shattered. One could say Brud was a multi-talented individual: not only did he excel in art and sports, he was an accomplished musician as well. During high school he played guitar in the Vinalhaven High School orchestra, and throughout his adult life continued to be part of many local groups, often playing at the Memorial Hall for the much loved and well-attended dances. At the time of his death at age 43, Brud was even jamming with a local kids group, which included Lawrence “Boongie” Oakes and Dale Conway. 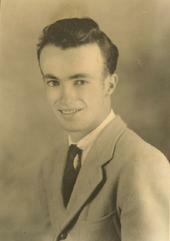 Married to Carolyn Brown Wahlman in 1954, the couple had three daughters. Each inherited a talent from their father’s creative gene pool. Ruth enjoys sports, Dawn shares her father’s passion for music and Lisa is a creative journalist. All were born and raised here and attended Vinalhaven Schools. For a period of time Brud had a photography studio in town (upstairs in the Moose Hall, current site of Harrison Reality), where his specialty was portraits. From here he often sent images to Rockland to be published in the Courier Gazette. Mike Bunker Sr., his nephew, recalls a time when Brud had a small make-shift darkroom under the stairs of his home on East Boston Rd. With just enough space to turn around, Brud would enlist the help of his young nephew to develop negatives and make prints of his work. Brud is also locally known for his inventive update of the branding iron already used by many Vinalhaven fishermen to stamp their license number or name on their gear. Previously the iron was heated in a woodstove until it became extremely hot, a slow and relatively dangerous practice. Brud devised a way to heat the iron electrically, a process much safer and more efficient. 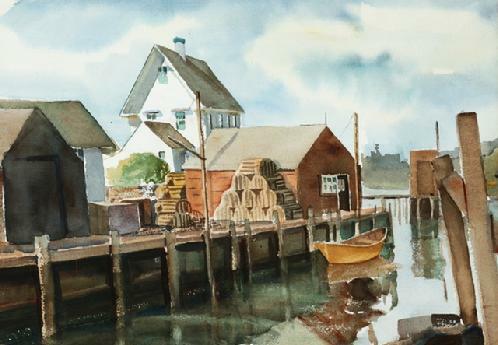 All through his life Clayter drew and painted landscapes, seascapes, portraits and more, preferring watercolors to other mediums. Though never formally trained, Brud had a natural talent and worked tirelessly perfecting his art. When asked where her father’s art studio was located, daughter Ruth replied, “The kitchen table.” Each evening after supper, Brud got out his watercolors and sat at the kitchen table doing what he loved best. While watercolors were his favorite, he did try working with oils. An oil painting of his father was one of his favorite works, but an attempt to paint a portrait of his mother in oils was unsuccessful. He could not capture her likeness to his satisfaction. Internationally known American social realist, Raphael Soyer, owned a summer home in Vinalhaven, and became a friend and mentor to Brud. Soyer offered help to the budding artist by giving suggestions and critiquing his work, all of which helped Brud improve and become more confident in his work. Soyer even suggested sending him to a Canadian art school, which Brud declined. Much of Brud’s work was given to friends and family, many pieces were bought locally, and some were taken by summer friends to Massachusetts to sell in their restaurant. The sale of one of his paintings always gave cause for the family to celebrate. Brud would pack up the family and drive them to the local restaurant, the Sea Breeze, for crab or lobster rolls, a big treat in those days. This year’s summer exhibit pays tribute to Brud’s life and work.